In Power Play - today's new update to Grand Theft Auto Online on PlayStation 4, Xbox One, and PC - power-ups change the rules of urban warfare giving players the chance to boost themselves and their allies with special abilities or even screw with their opponents in pursuit of ultimate victory. • Beasted: Transform into the Beast and use special powers like invisibility, super jump, and super strength. • Zoned: Slow down time for all players, giving snipers a tactical advantage over exposed enemies. • Raging: Unleash a rampage with your entire team by inflicting increased damage while taking reduced damage. • Flipped: Scramble your opponents by picking up Flipped, temporarily inverting all enemy camera controls and mixing team chat to truly get in their heads. • Dark: Take your team off the grid for well-timed sneak attacks. Each player can use one power up at a time, but layers of strategy exist through stacking power-ups with other teammates, or triggering power-ups to counteract enemy team advantages. Play this new Adversary Mode now via the Jobs menu or grab your best gunmen and battlefield tacticians to maximize 2X GTA$ and RP in the Power Play Playlist all week long. 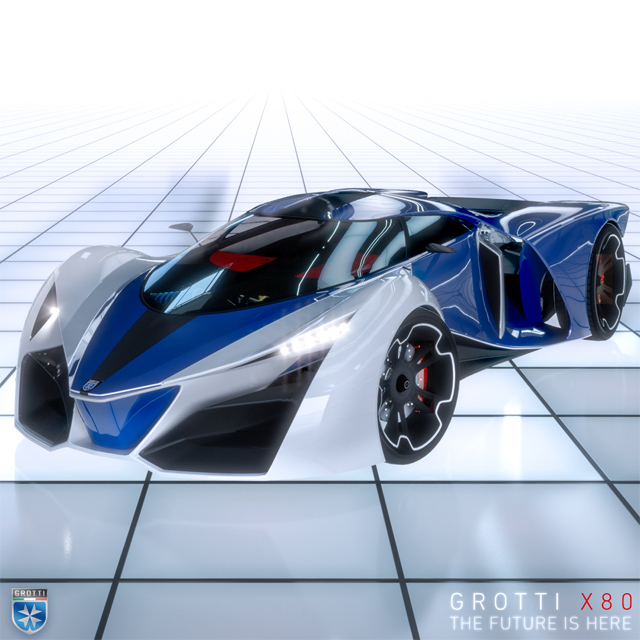 Today's update also features the addition of the blazing-fast Grotti X80 Proto to the Supercar roster at Legendary Motorsport. The space-aged, low-profile body harnesses a beastly engine making for a finely tuned machine ready for dominance – especially handy when needing to make Special Cargo Deliveries in a hurry. Escaping wanted levels has never looked so good. 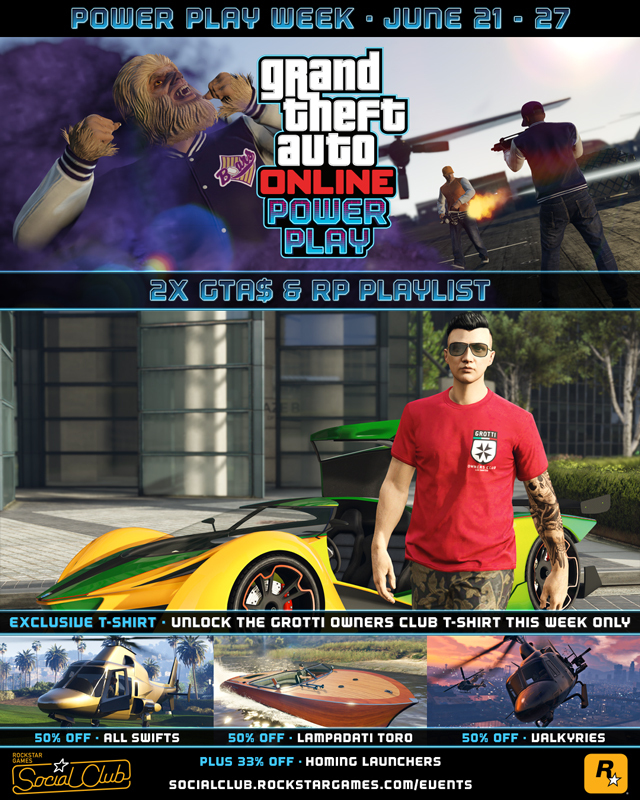 Celebrate Power Play Week and grab Double GTA$ and RP in the all new Power Play Playlist, available to access directly from the GTAV loading screen (and the Playlists section of the GTA Online pause menu) through June 27. And whether you’re a proud new X80 owner or an envious onlooker licking your chops, the new Grotti in-game tee is unlocked for all players this week simply by logging into GTA Online. Also enjoy steep discounts on an assortment of air and sea vehicles. Seafaring adventurers can get half off the luxurious Lampadati Toro, while ambitious Executives (and Other Criminals) can secure air superiority to support all their operational needs with half off all three variations of the Swift and the Buckingham Valkyrie, which is available to purchase this week without Heists prerequisites. 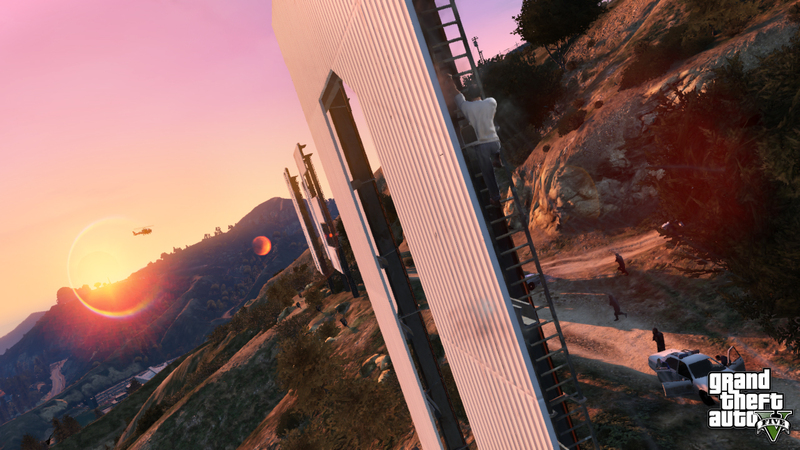 Finally, protect your Special Cargo from airborne assailants with 33% off the Homing Launcher. Power Play & Grotti X80 Proto Now Available - A new Adversary Mode and super car are now ready for your enjoyment in new-gen GTA Online.